We left the Ness yesterday afternoon, shoulders bowed, toes dragging in the dust, like bedraggled extras from some Foreign Legion desert film. The sun beat down and the nearest pubs to the Ness did amazing business. This morning, we arrived to find the rain pouring down, the wind howling and the site puddling before our eyes. Now, in late afternoon, the sun is back and discarded waterproofs are flapping in the breeze. It is, truly, a meteorologist’s nightmare, even if it remains, through storm and drought, an archaeologist’s delight. At least it gave the supervisors time to catch up with paperwork. More evidence for that came today from the midden areas around Structure Twelve. Eleanor reveals the bone spread in Structure Twelve. Tonnie continued working on the large piece of pot, decorated with multiple applied cordons. Then she found another piece just to one side. They are undoubtedly unusual and are not like anything seen on site before. Unfortunately they are both in perilous condition and will be sent for conservation although we will, eventually, be able to say something concrete about their significance. Not far away, Professor Alana Cordy, of the University of San Diego, uncovered a beautiful little worked stone bead. There is no decision yet on what stone it is fashioned from. It could be shale, jet, Canel Coal or even local mudstone. It is, however, a lovely little artefact. The next item on today’s finds list is quite astonishing. The multi-cordoned sherds revealed by Tonnie. It is not unusual to find beautiful tools, deliberately broken for unknown, and probably unknowable reasons. It is almost unheard of to find another part from the same tool, yet that is just what has happened this afternoon. Digging just outside Structure One last week, Jenny found a small polished stone macehead, never used and deliberately broken. Yesterday, from the same context, came another piece of the macehead. It does not seem to fit the original piece but is undoubtedly from the same artefact. 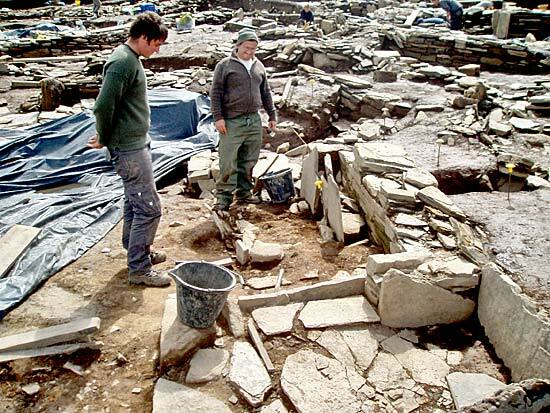 Site director Nick must have thought instantly about his recent trip to the National Museum, in Edinburgh, with a load of broken stone tools in an effort to find out if the broken tools from Orkney already in the museum would fit his. Not a single one fitted, or even looked as if it came from an already discovered tool. That is how completely unusual it is to find a second piece today. For that reason, if for no other, this years’ excavation will be savoured. STOP PRESS – After Hugo, Mark, Scott and Nick juggled with the two pieces like some primitive Rubik Cubes, the pieces just did not seem to match in any respect. It was only then that they realised that, although very similar geologically, the two pieces are in fact from two different maceheads! Jenny now enters that archaeological Hall of Fame as the discoverer of two maceheads – some archaeologists dig for a whole lifetime without finding even one! The appalling weather this morning allowed the students to have a fascinating seminar with Sarah Cobain on the next stage on from the flotation (immersing in water and straining) of organic material samples. Sarah showed them several examples from her own work identifying the resulting carbonised material, including crab apples with seeds and stems intact. In Trench T, and with the main trench impossible to work in, the digging continued with the displaced diggers from the other side of the house. They set to energetically and shifted huge amounts of soily, interface material. 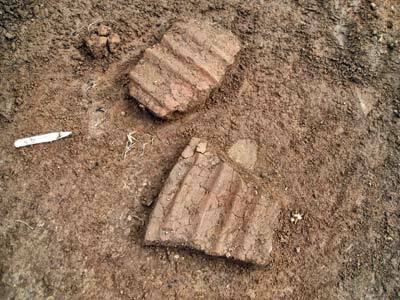 It soon became clear that the three fragments of iron found earlier are not representative and appear to come from a much later pit dug down into the rubble. Trench T has now, to Ben’s infinite relief, been returned to its Neolithic roots and, indeed, the late afternoon saw the likely identification of sherds of Neolithic pottery. In Structure Eight, planning has been completed but Dave and Jane have come down on to yet more roof tiles. Groans of commiseration could be heard all over the site for the tiles, although a major discovery, slow down progress significantly due to the need for very careful recording. In Structure Twelve, Eleanor is excavating the very large spread of bone and pottery which we have already mentioned. The bones are very large indeed and tomorrow we hope that bone expert Kerry Harris will examine them, perhaps also with Dr Ingrid Mainland. Lastly, one of the many visitors to the site was a journalist from the important Spanish newspaper El Mundo. He hopes to produce an article on the Ness in the immediate future. And tomorrow’s weather. Who can tell? 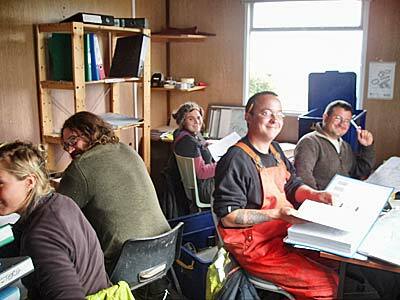 I was greeted by puzzled looks by my fellow University of the Highlands and Islands students when I arrived at Brodgar for my first day of excavation – after all, I’m an environmental science undergrad, not an archaeologist. My name is Elsa Panciroli and I’m in third year, based at Inverness College UHI. I came because I’m fascinated by the areas where archaeological science and environmental science intersect. I want to know things like what was the climate like at the time this site was built? What rock types are used and where do they come from? How did the people utilise their surroundings? 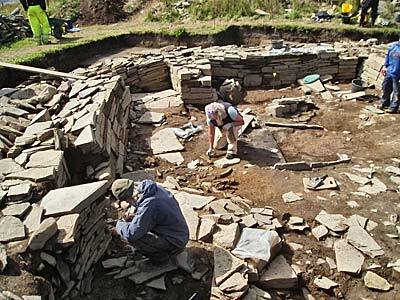 At Brodgar there are experts working on the answers to these and many more questions. When I arrived, I couldn’t tell a Neolithic pot fragment from a worn sandstone rock. A barrow is what you use to shift dirt isn’t it? I had a lot to learn, so my first two days have been about picking up the basic techniques involved in excavation and how to identify the different finds that might turn up during our time here. I got off to a flying start by finding a sliver of flint as dark as a thunderstorm. Today, I topped that with a thumb-sized chunk of Neolithic pottery and flint tool, probably a scraper, the worked edge clearly visible even after thousands of years. Trowelling is surprisingly fun. It has a peaceful zen to it — gently working back the layers and picking out burnt bone and small finds. My international fellow diggers are great people, many of them with fascinating specialisms or research projects. One of them explained how she is hoping to match pigments found at the site with corresponding geological formations around Orkney. Another is looking at non-local stone and asking where it came from and what it was used for. An expert in carbonised finds gave us a talk about the many different foodstuffs utilised by ancient people, and her work on wood, grains and nuts preserved in Flots. I was especially interested in what such finds reveal about the climate and vegetation in an area. I’m told cores have been taken from the two lochs which sandwich our dig site: the pollen, seeds and sediments in these should yield detailed pictures of the changing climate of Orkney. 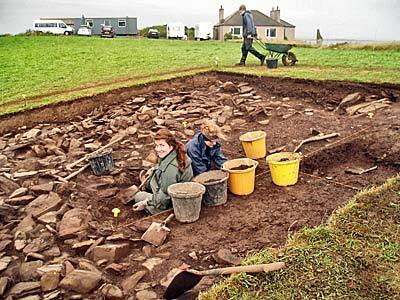 I still have two weeks ahead of me here at Brodgar. Each time I look up from the trench, I see the old red sandstone hills of Hoy rising out of the sea in the distance I think: yeah, this is a brilliant way to spend your summer. Woody and Hugo consider a plan of action regarding the layers surrounding the dresser in Structure Fourteen.